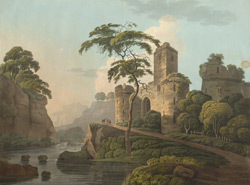 View of Okehampton Castle in Devon. It was built by Baldwin de Brionne, Sheriff of Devon, shortly after the Norman Conquest. He also founded the nearby town of Okehampton. The castle is situated on a rocky spur above the West Okement River. As can be seen it was a picturesque spot and the castle walls are heavily covered with foliage. The castle passed to the Courtenay family in the 1170s, who later rebuilt the castle. They made it one of the largest castles in Devon.